However, moving to cloud does not mean one cloud. Research suggests that organizations are opting for multi-cloud strategies[iii] as opposed to putting all their eggs in a single cloud vendor’s basket. 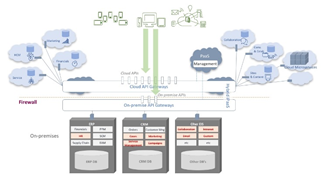 This best-of-breed approach to cloud adoption means that on-premises monolithic system(s)[iv] (e.g., an ERP) and other on-premises applications are re-implemented in the cloud as discrete SaaS applications and integrated or extended with PaaS. For those on-premises applications that either don’t have a cloud equivalent or simply don’t address the desired requirements, many organizations are also opting for application development in the cloud. [v] Microservices architectures[vi] have become predominant as an architectural style for implementing such cloud-native applications. To do this, a monolith is broken down into smaller pieces — each representing a business capability — and then implemented as a fully decoupled service (microservice),[vii] typically in PaaS. It also enhances an organization’s partner ecosystem by giving them on-demand access to relevant business data and providing the means to execute business transactions electronically. The use of APIs as the means to deliver standard, consistent and secured access to information enables multi-channel applications to consume the assets they need when they need them. Read the complete article here. API Event April 26th 2018 in London www.tinyurl.com/CapgeminiOracle.